In MyAdvo, since we value our customer, we understand not only their legal requirement but also other factors related to that. We believe in customer satisfaction, and that is the reason we maintain transparency in our payment system. We make sure that the client coming to us to take our service do not remain stressed regarding the financial matter, that in the end, he’ll get a bill of unbelievable huge amount. We disclose the total expenditure beforehand to the client. Internet Banking: We keep all our transactions on record, and do not evade any tax. Therefore we influence our clients to pay it through online transactions like net banking, credit/debit card etc. Easy Monthly Installment: The concept of EMI to reduce the financial burden has been accepted by MyAdvo. Our client can pay the instalments in cheques and online transaction. Cash: We understand that even today there are a number of people in India, especially our old age clients, they are not much comfortable with internet banking and card payments. So, besides cheques, we kept an option of paying by cash available for them. While accepting cash, you make sure to provide them with a receipt of the amount we have accepted. 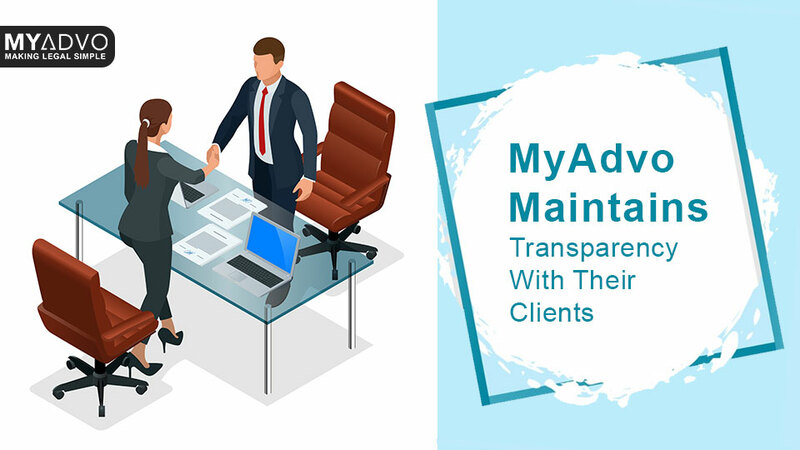 MyAdvo believes in giving a solution to the stress that the client is facing, not to add another stress of uncertain financial expenses. Once you choose the lawyer matching to your requirement, we negotiate with the lawyer, and fix the amount, and keep it constant throughout the case. Anyhow, this does not expect you to compromise with the quality services, we are always your hands on legal guide throughout your legal proceeding. So, next time when you think of legal - think of MyAdvo!